Advance wagering: Wagers that are accepted on a race later during a performance or on a future performance. AGC: American Greyhound Council Inc., a non-profit group jointly supported by American Greyhound Track Operators Association members and National Greyhound Association members, the purpose of which is to provide for the betterment of the welfare of racing greyhounds and the greyhound industry. AGTOA: American Greyhound Track Operators Association, a non-profit corporation comprised of owners and operators of greyhound race tracks. Backstretch: A straightaway on the far side of the race track. Bertillon Card: A greyhound’s identification card that lists 56 physical identifying points for every registered racing greyhound. Blanket: A covering for a greyhound bearing a number and color corresponding to its post position. Box: The post position the greyhound will be racing from or the starting box itself. Also describes a wager involving the inclusion of a combination of greyhounds in a race. Career record: A series of five numbers indicating, in order, a greyhound’s total number of starts, followed by first place, second place, third place and fourth-place finishes. Often preceded by an abbreviation showing the track at which the starts were recorded. Chart: A record of each race showing finish, calls, odds and comments describing each racer’s performance. Chartwriter: The person who compiles the charts and writes the comments on each greyhound’s performance during a race. Collided: A comment used by the chartwriter to designate major contact between two or more dogs during a race. Commingled pools: Money wagered at one track which goes into and mixes with wagering pool at another. Daily Double: A wagering term describing the selection of the first place finishers on consecutive designated races. Draw: A random process by which each greyhound’s starting position is determined. 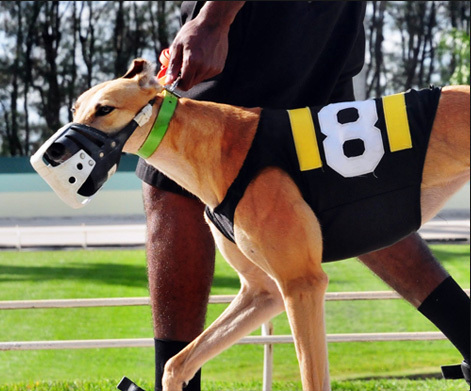 Flashy Sir Award: Given each year to the nation’s top distance (3-8 mile) greyhound by the Greyhound Review ; named for an outstanding distance greyhound of the mid-1940’s, now a Hall of Fame member. Forced out: A chartwriter’s term describing an instance of a greyhound being crowded to the outside by one or more opponents. Infield: Area surrounded by the oval track. In the money: A first, second or third-place finish. Interference: Intentional and unusual physical contact which obstructs or impedes the running of another greyhound as determined by the judges. After being called for interference, a greyhound must run in two schooling (non-wagering) races before racing in an official race. ISW: Interstate Wagering. Wagering which takes place between tracks located across state lines. Length: The margin equal to the length of one greyhound. Used to denote how far ahead or behind each greyhound is during or after a race. Measuring speed, each length is computed to represent about 7/100ths of a second. Maiden: Any greyhound that has not won an official race and is less than 2 years old. Mutuel Handle: The amount of money wagered. Muzzle: A wire, leather or plastic device, with a white tip, which is fitted over th greyhound’s mouth and jaws and used to aid in photo finishes. NGA: National Greyhound Association, made up of greyhound owners, breeders and trainers; recognized as a registry for racing greyhounds in the United States. Paddock: The area of lockout kennels, scales and inspection area. Pari-Mutuel: Betting among ourselves. Type of wagering system at greyhound, thoroughbred, harness and jai alai facilities. Post: A greyhound’s post position or starting box number. Post parade: The parading of the greyhounds before the race after they leave the paddock area. It includes the blanket and muzzle inspection. Program: A printed guide to the day’s races, including details such as the specifications and grades of individual races, post positions, past performances, charts, handicapper’s selections, overnight entries, track records and other racing statistics. Quiniela: A wagering term describing the two greyhounds finishing first and second in either order. Rural Rube Award: Given each year to the nation’s to sprint (5/16ths mile) greyhound by the Greyhound Review ; named for an outstanding sprinter of th late 1930’s, now in the Hall of Fame. Separate Pools: Money wagered on a race at another track which is totally apart from the pool at the other track. Superfecta: A wagering term describing the first four greyhounds crossing the finish line in a race. Takeout: The money taken from the betting pool to be divided among the track, the state and the operators. Totalisator machine: A computerized system that records amounts wagered, prints tickets for bettors and calculates odds. Tote board: A board which displays odds and payoffs. Trifecta: A wagering term describing the first three greyhounds crossing the finish line in exact order. Wheel: A wagering term describing the selection of a greyhound to win, place or show combined with every other greyhound in the race. Winner’s circle: Where the winning greyhound proceeds following the race, often to participate in a ceremonial presentation.